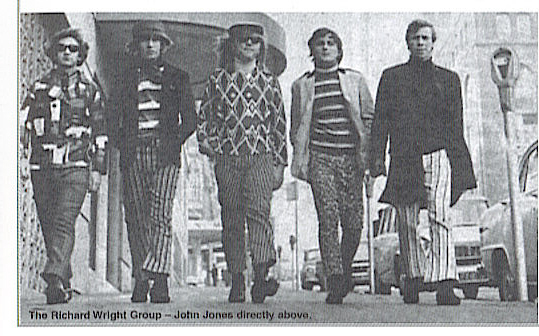 According to Vernon Joyson's Dreams, Fantasties & Nightmares, this Sydney-based R'n'B group were "notorious for the wild clothes they wore" and judging by the outrageous threads they're wearing in the photos, it's a fair statement. However, Joyson is in error in identifying lead singer Richard Wright as being the Melbourne musician of the same name, who was the drummer in both lineups of The Groop (1964-69). The rhythm section of Cogan, Ovendon and McDonald worked together for many years. They first teamed up in 1964 in their hometown of Newcastle, in a band called The Fiesta Men; this group cut one unreleased single and won the Newcastle heat of the Hoadleys Battle Of The Sounds in 1965. Ovendon, Cogan and McDonald then moved to Sydney and teamed up with ex-Brisbane singer Richard Wright and guitarist John Jones (ex Missing Links) as The Richard Wright Group. RWG released three singles on EMI's HMV label during 1966. The B-side of their first single, "Neither Rich Nor Poor", is a notable curio for Bee Gees aficionados, since it was written by Barry Gibb. The RWG version is the first known recorded version, and this song was apparently never released commercially by The Bee Gees themselves. According to Bee Gees historian Joseph Brennan, the track was cut before the Richard Wright Group formed and it possibly features the Gibbs on backing vocals and instruments; this might be one of the group of tracks The Bee Gees cut at St Clair Studios in Hurstville just before they returned to England. It was produced by EMI staff producer David Mackay, who is best known for his work with The Twilights and Johnny Farnham. Their second single, "Miss Hargreaves", is considered their best and has since been anthologised on Diggin' For Gold Vol. 4 and on the Raven LP compilation Ugly Things Vol. 4. Video footage of the group performing "Miss Hargreaves" on TV has apparently survived and circulates among collectors; likewise a performance of "No No No" from The Go!! Show broadcast on 22 August 1966. Wright left the band in 1967, so Jones took over as vocalist, Cogan switched to guitar and Ron Pommerel came in on bass. They shortened the name to The Wright Group and under that moniker they cut one further single, "Better Every Day", this time for the CBS. The Wright Group split after about a year, and in 1968 Jones and McDonald put together a new lineup with a new name, Wright of Waye. Cogan, Ovendon and McDonald also played in a Gold Coast based band called The Ghost of Electricity; the exact dating of this group in the chronology is still uncertain, but it was probably a shortlived project that existed between the end of The Wright Group and the formation of Wright of Waye. McDonald was reunited with Cogan and Ovendon in Southern Comfort in 1969. Ovendon is a long-serving member of Bullamakanka. John Jones now lives in America and is a successful screenwriter. Many thanks to Andrew Ainsworth for images and invaluable input. Please email webmaster@milesago.com if you have extra information or corrections, or to add to report any broken links.